The nucleus of Pala Sri Ramakrishna Ashrama was the Vedanta Sangham started in 1921 by a few young men at Vellappad, Pala. One of the promoters of the Sangham and an active worker, Chundakkad Sri Narayana Pillai came forward in 1923 with the proposal that the Vedanta Sangham should be converted into a Sri Ramakrishna Bhajana Sangham and that he would place a small building at its disposal. The proposal was accepted and a shrine was setup and regular puja began to be performed. This attracted many young men and women, especially Harijans who found a Saviour in Sri Chundakkad Narayana Pillai. He later on took Sanyasa with the name Ramakrishnanandaji. 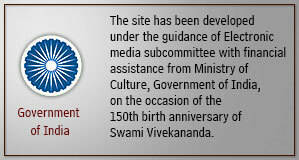 In 1926, Swami Vivekananda’s birthday was celebrated with great enthusiasm. The Sangham’s activities prospered and in 1927, the present premises of Ashrama was gifted by some devotees. Among them the names of late Swami Chidambaranandaji, his brother, late Thalayanakkandathil Sri Padmanabhan Chettiar deserve special mention. Some land was also acquired, for which the services of late Sri E. Parameswaran Pillai and late Sri M.K. Gopala Pillai were very helpful. On 26 April 1930 (15th Medam 1105 M.E) the installation ceremony was conducted in the presence of large crowd of devotees. Since then, the birthdays of Bhagavan Sri Ramakrishna, Swami Vivekananda and the Holy Mother were being celebrated with bhajans and speeches by eminent scholars. The Ashrama celebrated Vivekananda centenary on a large scale and a hostel in the memory of that occasion was constructed in the year 1963. The services of Swami Ramakrishnananda in the construction of this hostel will ever be remembered with reverence and gratitude. When Swami Subhranandaji retired from active work in 1974, Swami Vyomakeshanandaji was put in-charge of the Ashrama in 1976. In the interregnum, the Sri Ramakrishna Seva Sangham looked after the affairs of the Ashrama. Swami Vyomakeshananda, in spite of failing health, worked day and night, traveled far and near to collect the funds for construction of Pathasala building and for renovation of Ashrama and the hostel. Himself an educationist, he took keen interest in providing Sanskrit education in the Ashrama for which a Sanskrit class was started on the Vijayadashami day in 1976. The Pathasala was not only started in the Ashrama, but also at Valavoor, Kidangoor, Kanjirappally and Anikkad. Thus the Ashrama has become a centre of Sanskrit learning in Kottayam district of Kerala. But Swamiji could continue the work only upto 1980 March due to failing health. So he left for rest to Thrissur Ashrama. He continued to guide the Seva Sangham from his bed till October 1981. 11-08-1981 was a dark day in the annals of the history of Ashrama, since on that day Swami Ramakrishnanandaji passed away after a brief illness. He was a revolutionary in the strict sense of term since it was he who took up the cause of Harijans as early as 1922 when others could not even dream of such a plan. He started another unit of Ashrama at Edanad where he brought up Harijan boys, gave them education and made them conscious of their rights. On 04-11-1981 H.H. Sankaracharya of Kanchi Kamakotipeetham visited the Ashrama. He was received with full honors by the Sangham. His Holiness addressed the large number of audience. He advised them to learn Sanskrit, the repository of Indian culture.